I found myself caught off-guard by the recent revelation that Jeremy Corbyn had disparaged “Zionists” as not understanding “English irony” despite having “lived in the country for a very long time, probably all their lives”. It’s not that I did not previously believe he was antisemitic – I did, and he is. What surprised me was that, notwithstanding the slightest of “Zionist” fig leaves, it spoke to a particular middle-class, snobbish antisemitism that I have never particularly associated with the radical left. The response took me aback too. It’s easy to become inured to the bottomless barrel of meetings with and support for every shade of antisemitic crank that is Corbyn’s political career, but “English irony” seems to have had an impact unlike many of the less overt examples of Corbyn’s antisemitism. Presumably this is because there is no plausible denying the racism in questioning the Englishness of immigrant communities, and many of Corbyn’s more prominent defenders did not even bother trying, mostly lying low or implicitly arguing that his antisemitism is a price worth paying for the success of his project. Ironygate was significant in clarifying that those who support Corbyn now do so in the full knowledge of his antisemitism and will continue to do so regardless of further and ever more damning evidence. As pleased as I am to see that some of this is finally cutting through, I find myself concerned that this may be considered the high water mark of Corbyn’s antisemitism when far worse is being largely ignored or misunderstood despite being in the public domain. Corbyn’s condescending and plain wrong attacks on Jewish character – you’ll be hard pushed to find the Jewish 10 year old with a poorer sense of irony or history than Corbyn – speak to a more genteel antisemitism that got you black-balled from the golf club or excluded from a selective school, but more or less tolerated your existence. That kind of antisemitism is a racism not unlike others. All racisms have their own sets of prejudices and defamations but at heart, the haughty contempt is much the same. That’s the kind of antisemitism you can live with and our parents did. But there’s another antisemitism that sets it apart from “all forms of racism” (in that peculiar locution or verbal tic of Corbyn’s). Not the antisemitism of contempt but of dread of diabolical and supernatural Jew power. Antisemitism as conspiracy theory. Antisemitism as a world view. This is the deadly strain of antisemitism, or the bad antisemitism as Larry David might say, and there is plenty of evidence to show that Corbyn holds this conspiratorial, antisemitic world view. 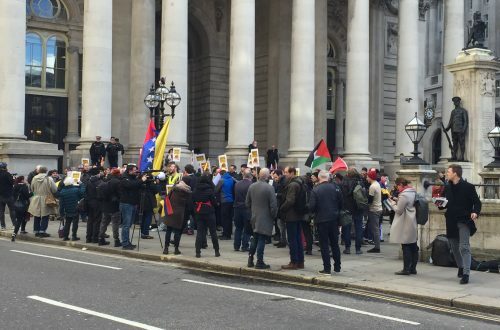 In 2011, Corbyn appeared on Holocaust-denying Press TV stating, “I think there is a bias towards saying that Israel is a democracy in the Middle East, that Israel has a right to exist, that Israel has its security concerns.” Unable to comprehend that journalists of good faith can and do believe that, like many other countries, Israel is a democracy, has a right to exist and has its security concerns, Corbyn leaps to some evidence-free conspiracy theorising to explain the apparent anomaly: “There is pressure on the BBC from probably Mark Thompson, who seems to me to have an agenda in this respect. There seems to be a great deal of pressure on the BBC from the Israeli government and the Israeli embassy.” Corbyn may or may not know that Mark Thompson’s father-in-law was the Jewish, Nobel Prize-winning physician, Baruch Blumberg. In 2012, Corbyn defended blood libeller, Raed Salah, against the Home Office’s failed attempt to have him excluded from the country. Then Home Secretary, Theresa May, stated that she wanted to exclude Salah as an extremist. Rather than accept that this was May’s sincerely-, if wrongly-held position, Corbyn called for a public inquiry into pro-Israel lobby funding of the Conservative Party, suggesting that “financial donations” from someone identified as being involved in Jewish communal bodies went “to the heart of what’s going on in the Home Office and the way the government makes decisions”. Later in 2012 and back on Press TV, Inspector Corbyn broached the subject of the recent jihadi murder of 16 Egyptian policemen (and the related incursion into and attack on Israel): “In whose interest is it to kill Egyptians, other than Israel?” Cui bono, Jeremy? “Would a Muslim go against his Egyptian brother and open fire?” asked Corbyn’s interlocutor, Lauren Booth. “It seems a bit unlikely that would happen during Ramadan, to put it mildly,” responded Corbyn, “and I suspect the hand of Israel in this whole process of destabilisation.” It’s obviously not Muslims, so it must be the Jews. Cui bono, indeed. And today, the Daily Mail reported perhaps the most bizarre (so far) of Corbyn’s conspiracy theories, his claim in 2010 that the then Israeli ambassador, Ron Prosor, had literally written British MPs’ statements on Israel’s deadly raid on the Mavi Marmara. It goes without saying that Corbyn’s “analysis” was fashioned from whole cloth. Individually these comments are prima facie evidence of Corbyn’s antisemitic thought process. They aren’t ambiguous, clumsy turns of phrases open to sympathetic interpretation. Each one exemplifies a mind-set that eschews obvious, common-sense explanations of events in favour of the hidden hand of Zion, with no proof required beyond the prejudices of his intended audience. And each imagined conspiracy is antisemitic in that it would never be applied in relation to any other country, and only makes sense as a reworking of the tropes of classical antisemitism. Collectively, however, Corbyn’s remarks paint a picture of a mind utterly steeped in antisemitic conspiracy theory: governmental subservience to Jewish interests; control of the media; destabilisation of governments; the hidden hand manipulating events; financial control. The existence of “Zionists in the accurate, political sense” is no more convincing a defence of Corbyn’s Jew as puppet-master, than the existence of people called Rothschild is of David Icke’s delusions. 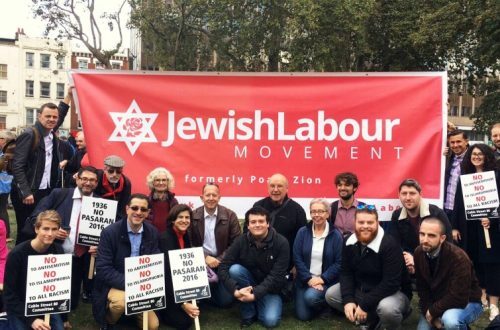 But even if you believe substituting “Zionist” or “Israel” for Jew provides benefit of the doubt against all the evidence, Corbyn’s conflation of Zionism and Jews disqualifies him from such generous interpretation. And in case you still hold on the belief Corbyn’s Zionist might be non-Jewish, here he is again, contrasting the “very strongly pro-Israel Zionist lobby” with “the Jewish tradition that I am in interested in… the Jewish tradition that I understand”. Of the four antisemitic conspiracy theories of Corbyn’s I’ve highlighted here, three have come to light in the last month. Doubtless there will be more. But even among his harshest critics there is the suggestion that Corbyn, so immersed is he in the Palestinian cause, is perhaps just blind to antisemitism. His continued and easy recourse to antisemitic conspiracy theory to explain uncomfortable events tells a different story. It’s time to accept that the reason he doesn’t see classical antisemitism in a mural when it’s pointed out to him, or is able to dwell in the antisemitic sewer that is Palestine Live without getting so much as a whiff of anything untoward, is because he is largely in accord with it all. With his record of knee-jerk reliance on antisemitic conspiracy theory and fundamental agreement with his brother on the subject of antisemitism, it’s time to ask whether there is anything other than electoral considerations separating Jeremy Corbyn from this. And what are the implications for British Jews of the Leader of the Opposition and likely next Prime Minister being a long-time subscriber to antisemitic fantasies about Jewish power?